Everyone wants their cats not only to lead happy and fulfilling lives, but also to be free from behavior problems such as not using the litterbox reliably, damaging your possessions with their claws, and being afraid of anything new and different. Our Helping Kitty Be Good program explains in detail how to provide litterboxes and scratching posts your cats will use because they conform to most cats’ natural behavioral preferences. Many cats are afraid of anything new and different because they are not well socialized. If your cat suffers from this problem, in Helping Kitty Be Good you’ll learn about socialization in cats and what you can do to compensate if your cats aren’t well socialized. Helping your cats overcome their fears will improve their quality of life. Promoting the health and welfare of indoor cats is a “hot topic” right now for the veterinary and animal welfare communities. Cat experts are recognizing that many indoor environments don’t do a great job at meeting the behavioral needs of cats. Helping Kitty Be Good gives you numerous ideas on how to enrich your cat’s indoor environment as well as how to provide safe outdoor time that can enrich your cat’s life. Understanding the unique behaviors and needs of your feline family members can help you provide them with the best environment to promote both physical and behavioral health. 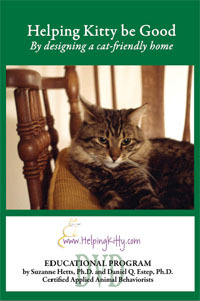 We’ve provided you with a sample of Helping Kitty Be Good right on this page. This video is the introductory section of the program. Helping Kitty Be Good is available in both DVD and audio formats. CLAIM YOUR COPY TODAY so you can design the home your cats have always wanted so they can live more stimulating, fulfilling, and problem free lives.